1942 - WWII has raged for 3 years and Europe is on its knees. France and Norway have fallen. England has been ravaged. Russia is under heavy bombardment. The freedom of Europe and the fate of the world are in the balance. This is where you begin. The Commandos Strike Force has been hand-selected from the most hardened regiments of the Allied armies. Specially trained in physical fitness, survival, weaponry and tactics, and armed with the latest equipment, their objective is to conduct missions behind enemy lines in order to disrupt enemy operations in advance of the main Allied assault force. The Commandos Strike Force is at the vanguard of the Allies fight back, employing unconventional and irregular methods to disable the enemy. 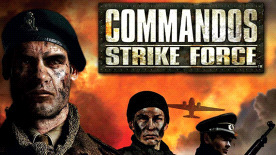 Commandos Strike Force is a 1st person action shooter featuring three characters with different abilities and skills. Undertake action, infiltration and stealth missions, engaging the enemy with a diverse arsenal of weapons and utilising intricate tactics. Sabotage, kidnap officials and foil enemy plans with incursions behind enemy lines. Fight in Stalingrad, Norway and France as the Green Beret, Sniper and Spy, switching between characters to adapt to all combat situations. Wage war in open, non-linear environments where you are in control - formulate and execute your own plans of attack; your actions will have reactions. Enter into battle alone, or with your friends online. Playtime is over - are you ready to be the best? Variation of Gameplay - Experience different gameplay styles, level lengths and intensities as you carry out raids, ambushes, rescues, sabotage, espionage and more. 3 Distinctive Characters - Play as a Green Beret, Sniper and Spy - each with their own unique skills and abilities, on their own or interchanging on-the-fly in selected missions. Intense Open Battlefields - Wage war in open, non-linear environments from the dark wooded forests of Normandy, to the icy terrain and mountains of Norway, to the bomb-blasted rubble of Stalingrad. Multiple Ways to Complete Missions - Choose how, where and when to fight. You are in control - formulate and execute your own plans of attack; your actions will have reactions. Ultimate Challenge - Progressive A.I. with personal attributes and natural behaviour. Non-player-characters are aware of their environment and remember past events. Incredible Replayability - Totally open level design with multi-paths and optional secondary objectives. Authentic WWII Weapons - The most complete arsenal of weapons and gadgets from the deadly specialist knives of the era to the mighty Panzerfaust . Really Be There - Advanced engine allows rag doll physics, particle effects, and interaction with the environment. Multiplayer - Play with your friends in online multiplayer battles with some unique play options. Supports up to 8 players on PlayStation 2 and up to 16 players on PC and Xbox Live.